The Surrogator®, a patented process, is a self-contained field unit that will establish a huntable population of game birds on your property. This is NOT an adult bird release system! The Surrogator® functions as a “surrogate parent” by providing food, water, warmth and protection for the first 5 weeks of the bird’s life. By placing the Surrogator® in a location where you would like to establish a huntable population of pheasant or quail, chicks raised in the unit become imprinted to that location. The bird's natural homing instinct motivates them to live and reproduce where they were raised and released. 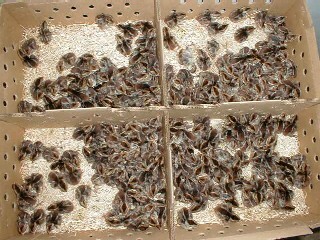 The Surrogator® will hold 125 day-old quail chicks or 65 day-old pheasant chicks until they reach 5 weeks of age. The greatest mortality on the life of game birds happens in the nest and before three weeks of age. Chicks raised in the Surrogator® are protected from predators and the elements at a time when they are most vulnerable. Research proves that game birds develop their natural survival instincts by 5 weeks of age. Chicks raised in the Surrogator® have limited human contact, further protecting the natural survivability of the birds. 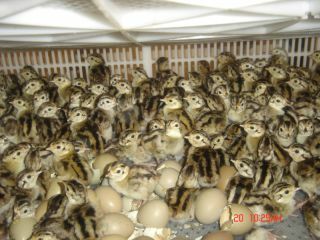 Now from CM Game Bird Farm & Hatchery you can buy your surrogator with chicks or without chicks. Please click here to purchase your surrogator or Call 207-433-0115 to place your orders!